• Two-speed control valves permit tool speed and stroke customization above 9.9 tons (9 tonnes). Contractor hydraulic hammers have been specifically designed as a solution for customers working in less arduous conditions. They provide a genuine JCB product for users on a budget who still want a good quality hammer that’s highly productive. Each hammer has been extensively tested and matched to work perfectly with JCB carrier machines. The range includes models, from the compact HM012T that tips the scales at just 220.5 lbs (100kg) operating weight to suit compact excavators, to models designed to work with the largest JCB excavators currently offered in North America, which fall in to the 22 ton category. All models come backed by a three-year manufacturer’s warranty. All Contractor breakers have accumulators to protect the carrier machine from hydraulic pressure spikes, reducing possible wear and tear on the hydraulic system. They are also equipped with auxiliary relief valves to protect the breaker from damage when used with other makes of machinery. Hammers for use with equipment above 12.1 tons in operating weight come as standard with a refillable auto greasing system, ensuring the breaker always receives the correct amount of lubrication throughout the working day. This cuts downtime and boosts productivity for the customer. All breakers feature dust seals to prevent dust ingress and to ensure that lubrication remains inside the hammer body. The heavier models include twin oval tool retaining pins which deliver double the life of a standard pin, as they can be rotated to wear evenly on both sides. Smaller breakers are equipped with a single tool retainer. Two-speed control valves on models above 9.9 ton carrier weight allow the operator to customize tool speed and stroke length, dependent on the material that is being broken. This increases productivity and reduces the risk of damage to the breaker and the carrier. Internal control valves deliver up to 10 percent higher efficiency against competitive products with external valves. This results in less maintenance as the oil flow is improved, reducing heat build-up in the system and protecting internal seals. Heavier models also feature blank firing protection, further cutting the potential for damage to the breaker and wear to the carrier machine. Contractor breakers use a single scaled design with the same maintenance requirements for each model. This ensures that dealer and customer service staff, particularly in a rental operation, can easily work on all hammers in the range. 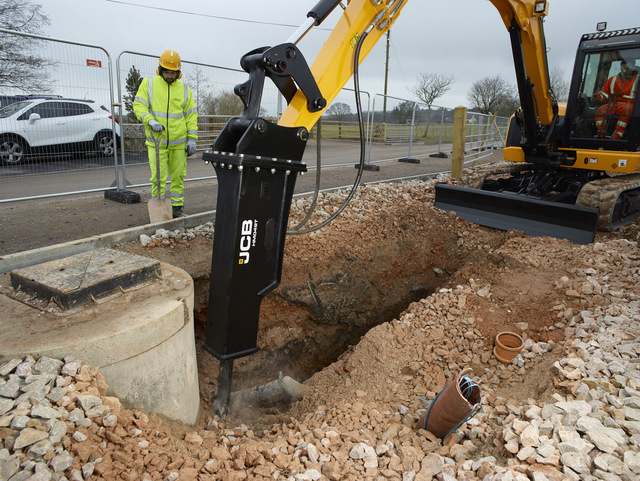 All JCB compact, Contractor and Professional breakers are delivered ready-to-work, with the correct mounting brackets and hydraulic hoses to match a wide range of JCB equipment. 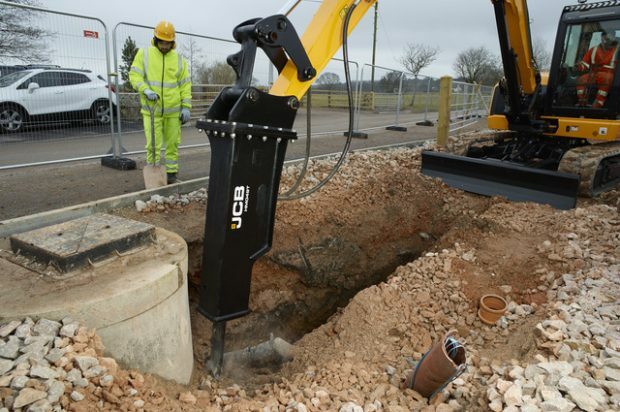 Compatibility is guaranteed and the full hydraulic hammer range is backed by JCB’s service network. For more bauma coverage, click this link. Do it now! HURRY!! !